Looking for some fun and nights of chatting with fellow travellers on our cosy pillows at the thematic reggae Roots Bar, listening to the music of our djs and getting a great meal, La Casona is the ideal spot! The bar is open all day long every day, where the bartenders sell the finest drinks at the best price in town!! Once a week, every Sunday, we get in touch with our local traditions grilling a BBQ in the argentinian way: the famous asados. On Tuesday, we get together -guests and staff- to have a group dinner. And on Saturdays night the Roots Bar takes you to a trip all around the world with our ethnic food cycle every Saturday a different destination! The service of free kitchen facilities can lead to try local dishes of fellow travellers. All our beds are equipped with a comfortable mattress and a backpack-sized locker. Fresh linen blankets and duvets are provided for the duration of your stay free of charge. And recently, in an amazing and recycled house weve opened the new Casona de Don Jaime 2, near the first one and also conceived as a comfortable place where visitors can enjoy being in Rosario!! Whats the difference between La Casona de Don Jaime 1 and La Casona de Don Jaime 2? They are both in downtown and near the river, and places where you can feel like at home..! In La Casona de Don Jaime 1 theres Roots Bar, therefore its a little bit noisier and full of people during weekens..! La Casona de Don Jaime 2, instead,has more private rooms (double, triple and quad rooms).. it also has a patio with bbq grill, a ping pong table and a only- pax Bar! But both Casonas are part of one single concept: we want to offer the best place and staff to receive you, thinking as travellers, working like hosts and enjoying like friends of your stay! With us you will get to know the city like no one else. From urban escapades to alternative tourism explorations as Kayaks, Horseback riding, Cabins, Sky Diving, City Tour, River Expeditions, Trecking, Fishing Safari, Bird Watching, Photo-shooting Safari, Water Ski, Wind Surf, Picnics, Football - Stadium on Sundays. Besides everything the hostel offers you, our international staff can provide you with all the information you need to get the most out of the Rosario experience!! Fourth night for free during the week in a dorm! There is no availability for La Casona de Don Jaime 2 on your selected dates. Amazingly friendly and helpful staff with great suggestions of what to visit and where to eat. The rooms themselves look like they could do with a little love, a fresh coat of paint, a cover over some wires but this is nothing new in the world of hostels! The rooms themselves are a good size and the lockers provided actually could fit all of your belongings and not just your valuables. 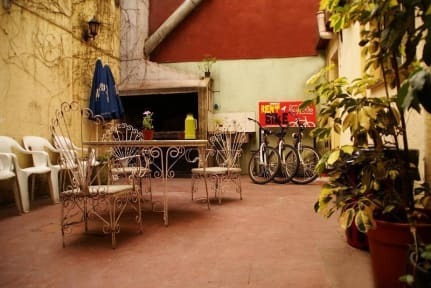 The hostel is in a good location for food, bars and sight seeing.] I'd definitely stay again. Comfy enough beds. Nice big fans to keep rooms cool. Personal lights above every bed which allows the main light to be switched off at a reasonable time without causing too much hassle. Great wifi throughout the hostel (even in your beds! I know, shocking). Friendly and helpful staff, providing directions and advice on spots to visit. No atmosphere what so ever though - 6 bed dorm to ourselves (no complaints there), but I wouldn't advise solo travellers to come here. Hot showers. Basic kitchen. Lovely old house with lots of potential but could do with a renovation! Bedrooms / bathrooms / kitchen all pretty run down. Very good location. No comfortable common area & would be good to have more plugs around the dormitories. Bedroom was also very hot. Bathroom and beds rooms are average. They try to make the place look clean. Breakfast was a no go. But they keep Dulce de leche in the fridge. The Location was really good. Very close to the city center. It is about 60 Peso to go there from the Bus terminal, not 30 as they recomment. Stuff is nice and helpful. Kitchen is ok. But: the room we had was really dark (8 dorms) and small and You cant lock the doors. The wommen bathroom has only two toilets and is really small too. In Adittion it was dirty during our stay. Where should I start? There were no spoons in the kitchen, the kitchen was pretty dirty and smelled funny, the beds made weird noises and the pillows looked truly disgusting, within 2 nights of staying there we saw many cockroaches (dead and alive), the staff was alright but not amazing, the people there were a little bit weird - therefore there was zero atmosphere in the hostel. Would not recommend at all... P.S. : They charge extra for air con use which we found pretty ridiculous.